This portal is manually maintained by Marshallsumter. Please contact these user(s) when you plan to make significant changes. This diagram compares the orbital elements and relative sizes of the members of the Himalia group. The horizontal axis illustrates their average distance from Jupiter, the vertical axis their orbital inclination, and the circles their relative sizes. This diagram illustrates the largest irregular satellites of Jupiter. Among the Pasiphae group, Sinope and Pasiphae itself are labelled. An object's position on the horizontal axis indicates its distance from Jupiter. The vertical axis indicates its inclination. Eccentricity is indicated by yellow bars illustrating the object's maximum and minimum distances from Jupiter. Circles illustrate an object's size in comparison to the others. Their semi-major axes (distances from Jupiter) range between 22.8 and 24.1 million km (the same range as the Carme group), their inclinations between 144.5° and 158.3°, and their eccentricities between 0.25 and 0.43. Carpo (/ˈkɑːrpoʊ/ KAR-poh; Greek: Καρπώ), also Jupiter XLVI, is a natural satellite of Jupiter. It was discovered by a team of astronomers from the University of Hawaii led by Scott S. Sheppard in 2003, and was provisionally designated as S/2003 J 20 until it received its name in early 2005. Carpo is about 3 kilometres (1.9 miles) in diameter, and orbits Jupiter at an average distance of 17.145 Gm (just over ten million miles) in 458.625 days, at an inclination of 56° to the ecliptic (55° to Jupiter's equator), and with a high eccentricity of 0.4316. Metis (/ˈmiːtɪs/; Greek: Μήτις), also known as Jupiter XVI, is the innermost known moon of Jupiter. It was discovered in 1979 in images taken by Voyager 1, and was named in 1983 after the first wife of Zeus, Metis. 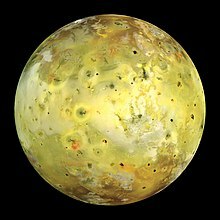 Additional observations made between early 1996 and September 2003 by the Galileo spacecraft allowed its surface to be imaged. Thebe (/ˈθiːbiː/ THEE-bee; Greek: Θήβη) also known as Jupiter XIV, is the fourth of Jupiter's moons by distance from the planet. It was discovered by Stephen P. Synnott in images from the Voyager 1 space probe taken on March 5, 1979, while making its flyby of Jupiter. In 1983, it was officially named after the mythological nymph Thebe. The second largest of the inner satellites of Jupiter, Thebe orbits within the outer edge of the Thebe gossamer ring that is formed from dust ejected from its surface. It is irregularly shaped and reddish in colour, and is thought like Amalthea to consist of porous water ice with unknown amounts of other materials. Its surface features include large craters and high mountains—some of them are comparable to the size of the moon itself. Their semi-major axes (distances from Jupiter) range between 19.3 and 22.7 Gm, their orbital inclinations between 145.7° and 154.8°, and their orbital eccentricities between 0.02 and 0.28. Adrastea (/ædrəˈstiːə/ ad-rə-STEE-ə; Greek: Ἀδράστεια), also known as Jupiter XV, is the second by distance, and the smallest of the four inner moons of Jupiter. It was discovered in photographs taken by Voyager 2 in 1979, making it the first natural satellite to be discovered from images taken by an interplanetary spacecraft, rather than through a telescope. It was officially named after the mythological Adrasteia, foster mother of the Greek god Zeus—the equivalent of the Roman god Jupiter. Do you have a question about Jupiter that you can't find the answer to? 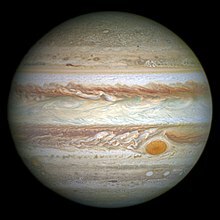 For editor resources and to collaborate with other editors on improving Wikipedia's Jupiter-related articles, see WikiProject Jupiter.